"Può essere che Mao se diletti et che impiastri anche lui; ma io non ho mai visto opere nessune di esso Mao"
This Caravaggio's historical assertion has conditioned Historical and Artistic Literature in the course of Centuries. Instead Caravaggio knows very deeply Mao's work, the success of which is evident by the strong presence of his paintings in the main Roman Collections. To prove it, it's possible to quote what Baglione says about him: "fu il primo che dipingesse ed accomodasse fiori con le foglie nei vasi con diverse inventioni, molte capricciose et bizarre, e in questo campo fece molto profitto". On one hand this affirmation shows his rich still lives production and the consequent substantial commerce that probably worried the ambitious Caravaggio and on the other hand it attests that Mao was one of the first painters that introduced new stylistic ways in the still life's ambit. To confirm it there's a flower still life quoted in Cardinale del Monte's inventory (1627); in the same collection there's a Caravaggio's painting "caraffa di fiori" got lost, probably motif of contrast on iconography's paternity among the painters. Thirty-six vases of flowers (and 2 of those with parrots) are mentioned in the Ludovisi Collection. Della Pergola records payments for flowers paintings in Borghese Collection in 1619. His activity is now under reconstruction because only few paintings of him are known for certain. The historical critic Alberto Cottino, referring to Salini, says that he's an emblematic case of the doubts and problems of reconstruction on the first still lives' painters in Rome in the early 17th century. In the last years some historical critics as Dr. Mina Gregori, Dr. Vittoria Markova, Dr. Cottino, Dr. Papi and others, gave their attention to Tommaso Salini considered one of the most important figure in Roman Still Life Painting of the early 17th Century and a painter able to develop new pictorical solution in a personal and luministic key. 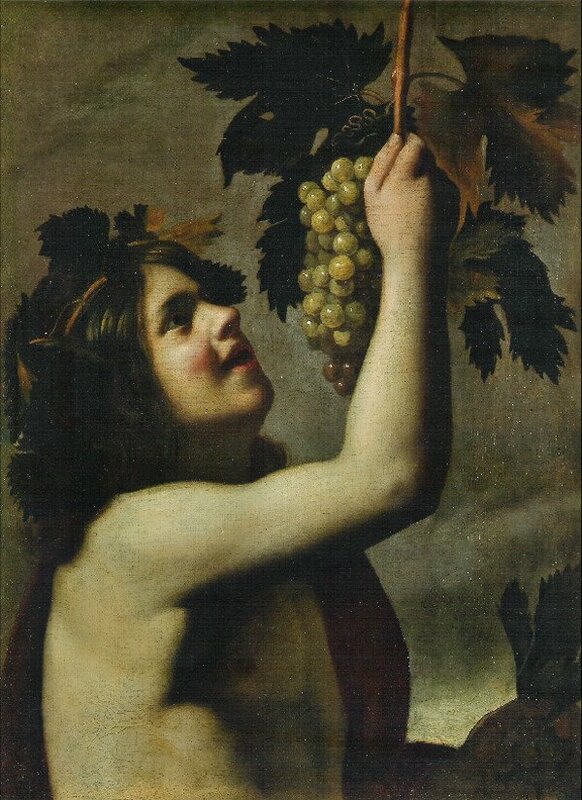 The position of young Bacchus seems to be taken by classical statuary of the first Century BC that probably he could see in Rome. In this case he develops a new personal luministic way. In our opinion this painting belongs to the first period of his production, before the "Ragazzo con la fiasca" in Thyssen Collection in Madrid, painting in which Tommaso Salini proves to have assimilated the Caravaggistic lesson on Light.